'A Bunch for the Weekend' is back for a new season and what a season it is! 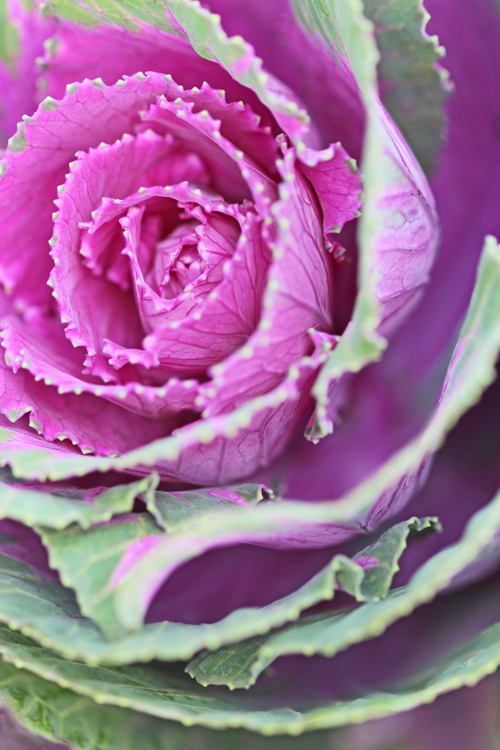 Autumn has some of the most fabulous colours and Ornamental Cabbage is one of my favourites. Big, bold and colourful - not a shy wallflower. - 10 Ornamental Cabbages with tall stems. 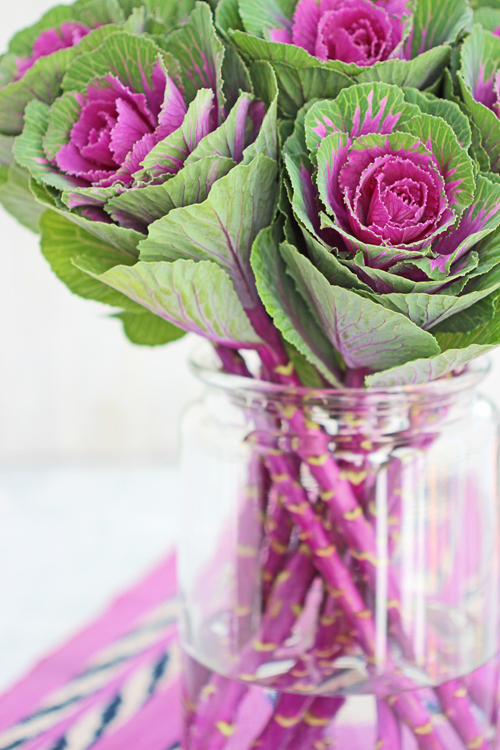 By florists they are also called Brassica. - a very large clear glass vase or jar - in this case I have used an oversized vintage pickling jar. - a piece of fabric in the same bold colour as the flowers. In this case I have used a Mexican shawl that picks up the bright pink. Condition the flowers by removing any leaves that would end up below the water line in the vase. This is to reduce any growth of bacteria from deteriorating leaves. Also remove any broken or bruised leaves. Cut the stems at an angle - this is to increase water absorption. Put in a clean container with fresh water and leave in a cool, dark place over night or at least for a few hours, to let the flowers absorb the maximum of water, before making the final arrangement. You might have to re-cut the stems while making the final arrangement to suit the size of the vase or container and to get the right proportions. 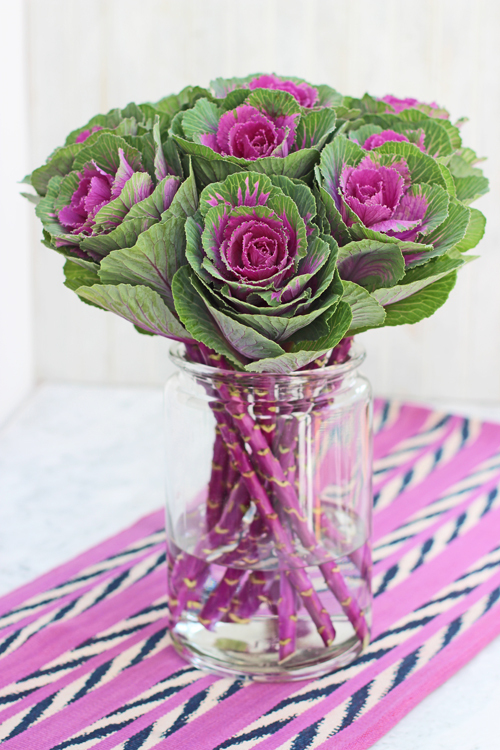 This type of Ornamental Cabbage usually comes with long stems - without leaves. Remove any yellowing top leaves as well as any small dried bits on the stalks. Fill the container one third with fresh, clean water. Trim the stems so that the lower leaves rests on the edge of the vase. I love seeing the colourful stems through the clear glass criss-crossing and making interesting angles. Turn the flowers so that you can see the colourful centre of the flowers. Add a colourful tablecloth or other piece of fabric. Change the water every 2-3 days and keep removing any yellowing leaves. The flowers lasts for about 7-10 days. Enjoy this unusual flower while it is available at this time of year. It might not be to everyone's taste but it will certainly add a splash of vibrant colour and texture to your arrangement. Enjoy your flower arranging and have a great floral day! I will be back on Sunday with another Florets - floral quotes by people passionate about flowers! Une très belle fleur... et quel fabuleux arrangement de votre part ! Des photos superbes. 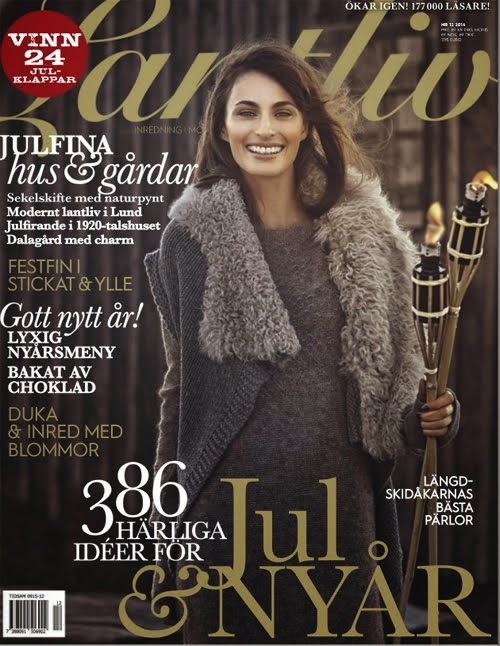 Så vackert det är med kål, jag har en enda liten som jag köpte häromdagen till ett höstarrangemang. you always have just the right extras to make the flower colour sing. That Mexican shawl is such unusually beautiful fabric! 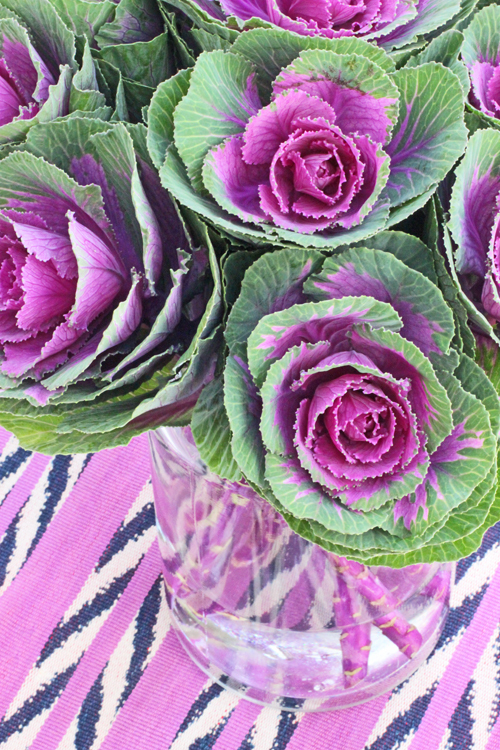 The colors in those cabbage flowers are exceptionally lovely. It's hard for me to believe that it's that ornamental cabbage time of year already...but each season's flowers are beautiful in your hands. Dekorative planter som jeg alltid glemmer å så om våren... De er jo så fine nå!